According to the American Heritage Dictionary, Main Street is "the principal street of an American small town or city". Wanting to be on the principal street in any given town or city, is maybe why there have been so many tattoo shops having a Main Street address in America. 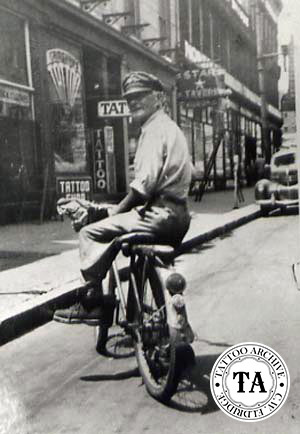 Arguably the most famous Main Street for tattooing in America was located in Norfolk Virginia. Over the years this street has seen the likes of Getchell, Lawson, Sturtz, Greenwood, Platt, Grimshaw, Cleveland and of course Cap Coleman. Coleman liked Norfolk's Main Street so much that the city directory showed him as having at least 5 different locations there. In 1919 he was at #429 Main, in 1920 at #526 Main, in 1923 he could be found at #405 and 819 Main Street, in 1924 he finally settled down at #427 Main Street where he stayed until 1950 when the city fathers closed down Norfolk to tattooing. 316 S. Main Street, LA. 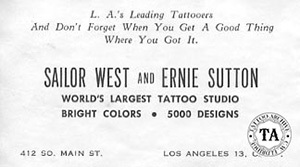 510 S. Main St., LA.